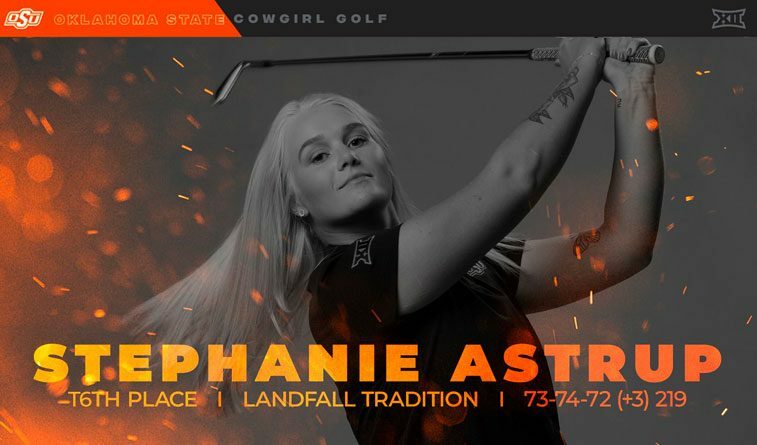 WILMINGTON, N.C. – Oklahoma State’s Stephanie Astrup used a final-round even-par 72 to finish in a tie for sixth place at the Landfall Tradition. The sophomore carded a trio of birdies on Sunday to earn her best career finish and the best finish by a Cowgirl this season. Astrup navigated the Country Club of Landfall course with consistent rounds of 73-74-72 to finish 3-over 219. As a team, the Cowgirls finished 11th overall at 46-over 910. Duke took top honors on the team leaderboard at 15-over 879, while Blue Devils Virginia Elena Carta and Gina Kim tied for medalist honors at even par 216. OSU’s Chih-Min Chen finished in a tie for 32nd at 10-over 226, while junior Michelle Forsland ended her weekend at 15-over 231 and in a tie for 53rd place. Sophomore Emma Whitaker finished in a tie for 68th and freshman Faith Hopkins was 92nd. The Landfall Tradition was the final even of the fall for the Cowgirls, who will return to action at the Northrop Grumman Regional Challenge in Palos Verdes, California on Feb. 3.